In Part One I sought to emphasize that at the heart of what set groups referred to as Anabaptists apart from both Protestants and Catholics was their desire for a complete separation between the church and the state. This has gotten denominations that hold to an Anabaptist interpretation labeled as “separatists” or “radicals.” The latter refers in particular to the Anabaptist effort toward a literal New Testament application of Scripture to church organization and practice (ecclesiology in theological terms). Others historically have also sought this to varying degrees. The more congregationally-minded Puritans come to mind, as do the Plymouth Brethren who made a very commendable effort toward implementing apostolic church patterns. The Anabaptists were unique in the sense they didn’t consider themselves reformers. Technically, the Reformation as a historical movement began by seeking reform of the Roman Catholic Church. When it became clear this wasn’t going to happen, recognized Reformation vanguards such as Luther, Calvin and Zwingli began their own churches outside of and in defiance to the Pope’s authority. In an effort to rid the church of extra-Scriptural Roman additions and practices, their cry was “Sola Scriptura,” or “Scripture alone.” These “Protestants” were protesting against Roman Catholicism—reformers seeking to reform the Catholic Church. In contrast, however, the Anabaptists had no desire to reform Catholicism. They considered the Roman church a false church and as such were only interested in a complete and irrevocable break from her. The Anabaptist perception was that the the Roman Catholic Church had drastically departed from biblical teaching as a result of its alliances with earthly governments. Though I’m speaking in generalizations, most separatists would view the year 313 AD as the crucial turning point. This is when Constantine officially endorsed Christianity. Christianity in effect became a state religion, thus begetting the term Christendom. A generally held theory is that this point in time represents the “fall of the church.” Now it could legitimately be argued that the early so-called church fathers like Tertullian, Clement and Origen had already themselves done a good bit of departing from New Testament principles. But they all lived in a time period before Constantine’s decree when Christianity was still experiencing a fair amount of persecution at the hands of the state. From the reign of Constantine onward, the church/state alliance grew progressively stronger. By and large, the kings during the Middle Ages bowed to the bidding of the Popes. The masses, primarily peasants, were illiterate. And until Gutenberg’s printing press followed eventually by the availability of translations of the Bible into common languages, Bibles were rare and outrageously expensive anyhow. The Church, with its power-base in Rome, not only “interpreted” the Bible for the masses, but continually added to the Bible’s teachings. The result was the Roman Catholic Church grew into what many considered a religious monstrosity, irretrievably having departed from biblical Christianity. A primary tenant of Anabaptism, therefore, was that the kingdom of God is separate and distinct from the kingdoms of the world. This distinction must be maintained or the state will inevitably and negatively influence the church. This idea wasn’t an attempt to promote rebellion against the state. On the contrary, history shows that Christians who’ve attempted to apply the Scriptures to their lives have consistently been the most law-abiding and respectful citizens of any state. The purpose of emphasizing the reality of the kingdom of God was both a reflection of the Anabaptist understanding of Scripture and an attempt to maintain purity within the church. One thing about a state church is that everyone is a member. Within the church there is no distinction between those living a moral life consistent with the Bible’s teachings and those who are not. This rightly bothered Martin Luther, even though he was the de facto leader of the German state church (i.e., the Lutheran church). He admired the Anabaptists’ ability to maintain a high degree of moral purity within their fellowships. Unfortunately, however, this didn’t keep him from eventually turning against them because of what he considered their excessive resistance to church-state influence and their “extreme positions.” John Calvin too faced the problem in Geneva of how to insure Christian ideals among the populace. He ended drafting a lengthy list of do’s and don’ts for the entire citizenry to follow, accompanied by stiff penalties for their infractions—penalties to be enforced, of course, by the civil authorities. The Anabaptists, on the contrary, desired that those who cast their lot with them to voluntarily choose the path of obedience, without coercion from either the church or the state. Jesus said, “If anyone wishes to come after Me…” Jesus gave people a choice. And in Anabaptist thinking, a personal choice is exactly what has to occur in order for the church to be retain its biblical legitimacy. Hence they placed great emphasis on discipleship—that is, following in the footsteps of Christ by obeying His teachings. So another distinguishing tenant of Anabaptism was the individual’s pursuit of holiness as a lifestyle. But here’s the rub. How do you maintain church purity? Is obedience even enforceable? The Roman Catholic Church’s solution was often to burn their opponents at the stake, chop their heads off, or simply drown them. But this usually had little to do with how a person was behaving as much as with what he was teaching or with whom he was associating. I don’t think I need to go into any detail as to why this approach to dealing with dissent is not appropriate. It’s certainly not Biblical. Sadly, Protestants have been guilty of similar practices. Michael Sattler, a leader among the Anabaptist Swiss Brethren, was put to death with the approval of Ulrich Zwingli, the leader of the Protestant reformation in Zurich. And John Calvin infamously supported the Geneva civil authorities’ execution of Michael Servetus for his heretical views on the Trinity. I don’t say all this to pick on Protestant reformers. Many certainly earn our respect, both for their courage and teachings. But I don’t feel we can dismiss their actions lightly, especially when they condemned Rome for what they turned around and did themselves; namely, persecuting those with whom they disagreed. 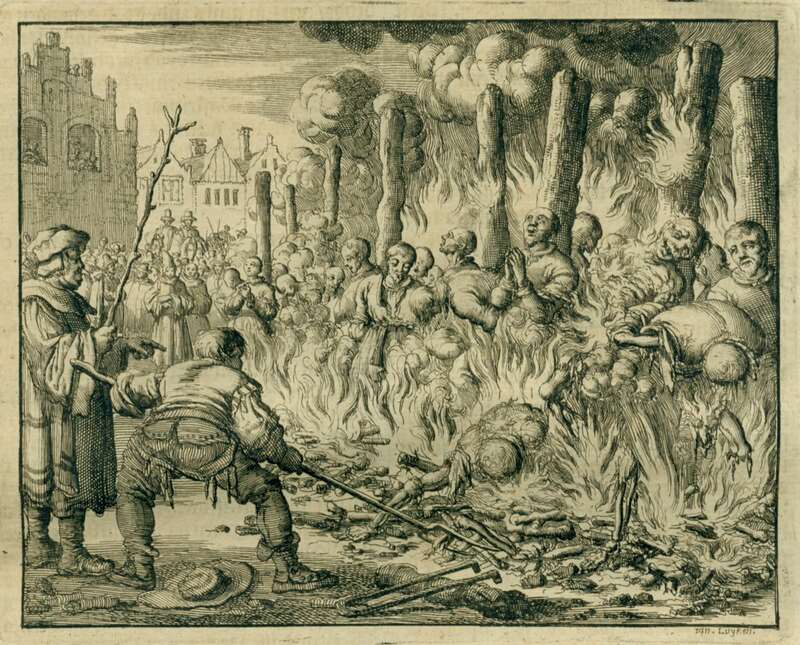 How then did the Anabaptists handle church discipline? They rejected the use of the sword on any condition, having personally felt its sting. They instead followed the New Testament teaching that directly addresses the way in which an errant brother or sister should be dealt with. That is, the unrepentant member was turned out of the fellowship with the hopes that he would eventually repent and seek restoration with the church. This was definitely an improvement over physically persecuting dissenters and it often proved to be a highly effective means of restoring wayward brethren to the path of obedience. Thus another tenant of Anabaptism rises to the forefront: God has ordained the state, not the church, to wield the sword. This has all sorts of implications. For one, as noted, the church is not in a position to punish those who break laws of the state. This is the government’s job through the medium of the justice system. The corollary of this is that the church renounces any authority to punish, lethally or otherwise, “heretics.” The church’s authority is spiritual in nature and is exercised within the fellowship of believers who’ve voluntarily chosen to place themselves under the ultimate lordship of Jesus Christ. Believers acknowledge the state’s duty and God-given right to punish criminals. But the church does not seek nor expect the state to collude or interfere with matters that clearly fall out of its jurisdiction. This view of the church’s role verses that of the state also means that the Anabaptists generally taught it was wrong for a Christian to be in the military or to take part in state-sponsored wars. The Christian, as a man of peace, has no business killing on behalf of the state. This conviction alone was enough to draw the wrath of kings and state churches down upon the brethrens’ heads. The sixteenth-century witnessed regular skirmishes between Christendom and Islam. Because the Anabaptists refused to take any part in these fights, they were often accused of siding with the Muslims. In reality, they took no side but the side of peace. The Christian and state-sponsored war issue is beyond the scope of this post. I simply at this point want to point out the Anabaptists refusal to take up arms was one of their distinguishing features. Lastly, and this is related to what’s already been said, the Anabaptists were among the original Congregationalists. They believed that each fellowship was an autonomous unit, not under the authority or jurisdiction of any other church or centralized church authority. Scripture alone was the church’s guide and ultimate source of appeal. Jesus Christ was the head, and the Holy Spirit was present in each fellowship to lead the brethren into all truth. So not only was a state/church distinction maintained, but an insistence upon local church autonomy was as well. – Maintaining clear distinctions between the kingdom of God and the kingdoms of the world. – The pursuit of holiness through consistent obedience to the Bible’s teachings. – The refusal to take up the sword. – The autonomous nature of the local church, or fellowship. Admittedly, this is not an exhaustive list. Rather it represents what I perceive as main components of Anabaptist thinking. Also, I acknowledge this post has been a somewhat technical, but I feel necessary if one is to begin to gain an understanding of Anabaptist history and convictions. In Part Three I hope to discuss more speculatively the implications of these beliefs, both for the individual and for society as a whole.